Background Postnatal depression is a medical condition that affects many women and the development of their infants. There is a lack of evidence for treatment and prevention strategies that are safe for mothers and infants. Certain dietary deficiencies in a pregnant or postnatal woman’s diet may cause postnatal depression. By correcting these deficiencies postnatal depression could be prevented in some women. Specific examples of dietary supplements aimed at preventing postnatal depression include: omega-3 fatty acids, iron, folate, s-adenosyl- L-methionine, cobalamin, pyridoxine, riboflavin, vitamin D and calcium. Objectives To assess the benefits of dietary supplements for preventing postnatal depression either in the antenatal period, postnatal period, or both. Search methods We searched the Cochrane Pregnancy and Childbirth Group’s Trials Register (30 April 2013). Selection criteria Randomised controlled trials, involving women who were pregnant or who had given birth in the previous six weeks, who were not depressed or taking antidepressants at the commencement of the trials. The trials could use as intervention any dietary supplementation alone or in combination with another treatment compared with any other preventive treatment, or placebo, or standard clinical care. 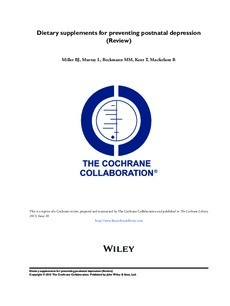 Data collection and analysis Two review authors independently assessed trials for inclusion and assessed the risk of bias for the two included studies. Two review authors extracted data and the data were checked for accuracy. Main results We included two randomised controlled trials. One trial compared oral 100 microgram (μg) selenium yeast tablets with placebo, taken from the first trimester until birth. The trial randomised 179 women but outcome data were only provided for 85 women. Eighty-three women were randomised to each arm of the trial. Sixty-one women completed the selenium arm, 44 of whom completed an Edinburgh Postnatal Depression Scale (EPDS). In the placebo arm, 64 women completed the trial, 41 of whom completed an EPDS. This included study (n = 85) found selenium had an effect on EPDS scores but did not reach statistical significance (P = 0.07). There was a mean difference (MD) of -1.90 (95% confidence interval (CI) -3.92 to 0.12) of the self-reported EPDS completed by participants within eight weeks of delivery. There was a high risk of attrition bias due to a large proportion of women withdrawing from the study or not completing an EPDS. This included study did not report on any of the secondary outcomes of this review. The other trial compared docosahexanoic acid (DHA) and eicosapentaenoic acid (EPA) with placebo. The trial randomised 126 women at risk of postpartum depression to three arms: 42 were allocated to EPA, 42 toDHA, and 42 to placebo. Three women in the EPA arm, four in the DHA arm, and one woman in the placebo arm were lost to follow-up. Women who were found to have major depressive disorder, bipolar disorder, current substance abuse or dependence, suicidal ideation or schizophrenia at recruitment were excluded from the study. The women who discontinued the intervention (five in the EPA arm, four in the DHA arm and seven in the placebo arm) were included in the intention-to-treat analysis, while those who were lost to follow-up were not. Women received supplements or placebo from recruitment at a gestational age of 12 to 20 weeks until their final review visit six to eight weeks postpartum. The primary outcome measure was the Beck Depression Inventory (BDI) score at the fifth visit (six to eight weeks postpartum). No benefit was found for EPA-rich fish oil (MD 0.70, 95%CI -1.78 to 3.18) or DHA-rich fish oil supplementation (MD 0.90, 95% CI -1.33 to 3.13) in preventing postpartum depression. No difference was found in the effect on postnatal depression comparing EPA with DHA (MD -0.20, 95% CI -2.61 to 2.21). No benefit or significant effect was found in terms of the secondary outcomes of the presence of major depressive disorder at six to eight weeks postpartum, the number of women who commenced antidepressants, maternal estimated blood loss at delivery or admission of neonates to the neonatal intensive care unit. Authors’ conclusions There is insufficient evidence to conclude that selenium, DHA or EPA prevent postnatal depression. There is currently no evidence to recommend any other dietary supplement for prevention of postnatal depression.